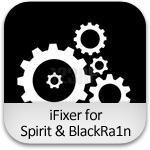 Put the Blackra1n or Spirit jailbreak and iFixer in the same folder. Run the iFixer as an Administrator. The iFixer interface comprises two buttons, one for Spirit jailbreak Fix and the other for Blackra1n jailbreak fix. Hit the button labeled with the Jailbreak tool you’re going to use. that’s it. You can follow us to Twitter, Join us at Facebook, and also Subscribed to RSS Feed to receive latest updates on iPhone, iPod Touch and iPad jailbreak and iPhone unlock stuff. I jail broke my ipod with spirit and today it crashed. Whenever you try to turn the ipod back on it goes to the apple screen and then turns back off. I can’t get it to register to iTunes or anything. Any advice? Thanks for your good post and Will be back to chech out more posts keep up the great work!